Join us in the upliftment and freedom of the worldwide feather tribe with this beautiful Flower of Life adjustable ring... #TogetherWeFly! It is believed that The Flower of Life represents or depicts the cycle of creation. This symbol shows that all life and consciousness arises from one source (this being the first circle). The next 6 circles are identical with the cell division process. Therefore, the Flower of Life is seen as a model of God’s Creation. 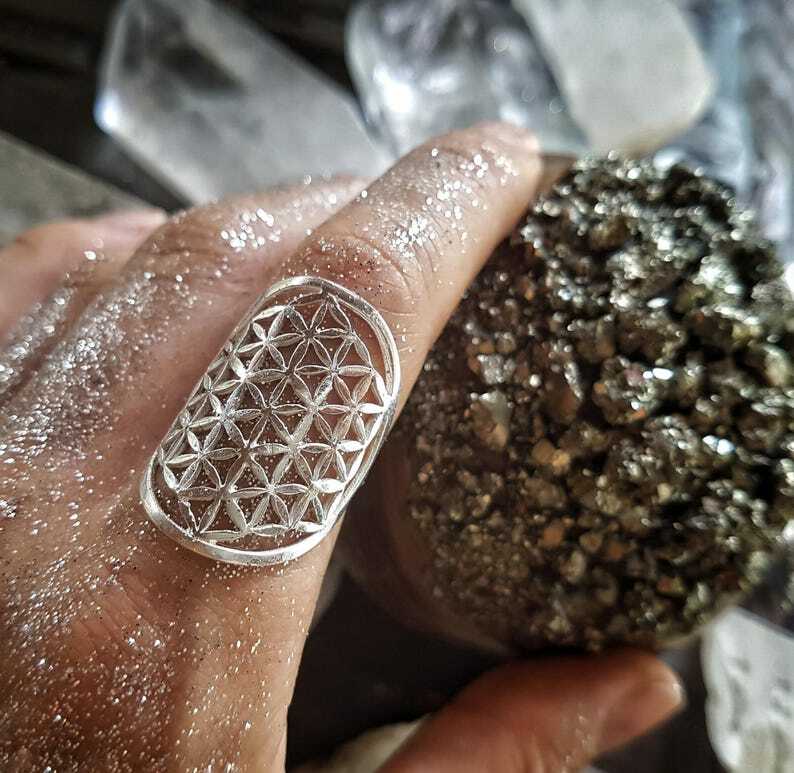 The Flower of life ring is excellent for healing and helps in connecting to the higher self. It is just 1.18 inches (3 cms) x 0.78 inches (2 cms) across and adjustable so one size fits all. The metal is thin and is easily adjusted when warmed in the hands, it is a comfortable ring to wear. This ring comes in Plated Silver. Easy and delightful service, a mix up with my order was very quickly amended and the rings are beautiful, easily adjusted and exactly what I was wanting! Beautifully crafted and delicate ring. Easily adjustable too. Es tal cual la foto. Perfecto. Gracias.